Comments: I would like to name this male manta ray, Triton. Around 1:30pm at Honolua Bay, my girlfriend Dayna and I were freediving and taking photos of the honu at the cleaning station when we both spotted this lovely Manta. He was approximately 5ft in width. He made two passes below us over the sandy bottom next to the reef. 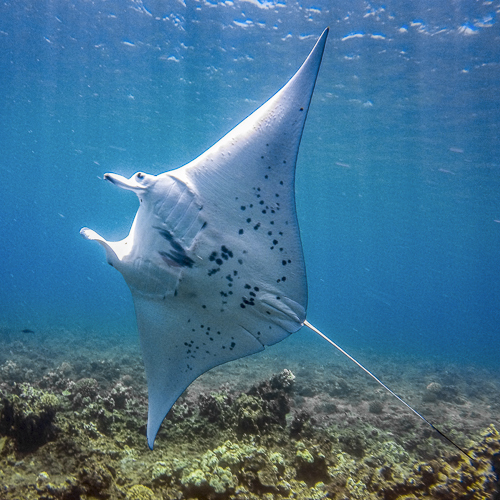 With my GoPro in hand, I was able to dive down and catch-up to the manta ray and capture some video/photos. On his second pass, I was able to get some great ID shots as he turned and swam completely sideways showing off his ventral side before he cruised off into the blue.